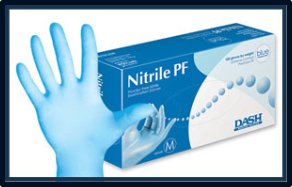 Dash Nitrile PF Exam Gloves. Blue Nitrile Powder Free Exam Gloves with a Textured Surface. Puncture resistant and fully textured for an enhanced grip, Nitrile Powder Free gloves from Dash maintain a soft, comfortable feel that won't cramp your hands. Protein free and powder free, Dash Nitrile PF gloves are also tested and approved for use with chemotheraphy drugs.